A rehabilitation project causes one-lane travel on the Kutz Bridge of eastbound Independence Ave. until June 7. WASHINGTON – Just one lane will be open to traffic on the Kutz Bridge this weekend and drivers traveling around the National Mall should expect delays. 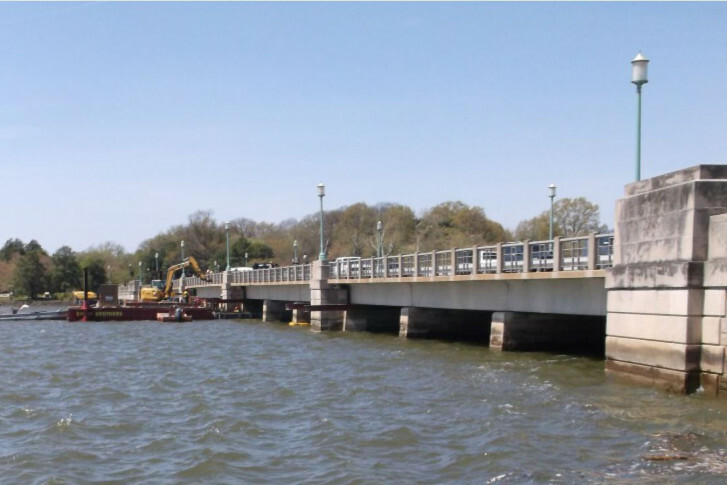 The bridge carries eastbound Independence Avenue traffic over the Tidal Basin. On Saturday and Sunday, the left and center lanes of the Bridge will be closed. Work will take place during off-peak hours during the work week. And the left and center lanes will continue to be closed until 8 p.m. Tuesday. The the north sidewalk will also be closed to pedestrian traffic. Work includes asphalt and waterproofing repairs to the road and structural repairs to the bridge itself. Construction began in April 2015. And according to the Federal Highway Administration, repairs should conclude sometime this year. Check the FHA’s website for more updates on this project.